Progressive Metal is not a young genre, but it allows the bands to use many different experimental approaches that sometimes could be seen as weird for many. 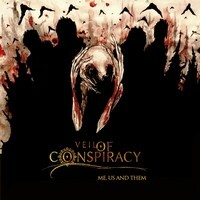 It’s a matter of becoming used to hear it, as it’s needed to understand what the Italian quintet VEIL OF CONSPIRACY plays. Their first album, “Me, Us and Them”, is a set of differences being thrown on our ears. One of their best features is that they aren’t as technical as many bands from the genre, using something simple and easy to be understood, but the experimental insight of the band lies upon the mix of extreme Metal influences with some modern touches and even Doom/Gothic touches. And the focus on the guitars to create the melodic lines (and not on keyboards, besides some parts with them can be heard in many moments, as on “Split Mind”) is a fine choice. Yes, it’s very good. “Me, Us and Them” shows a very good sound quality, allowing the listeners to understand fully what the band is up to, balancing weight and aggressiveness in a very good way. And the choice for the instrumental tunes was very good (though it’s not perfect). Musically, VEIL OF CONSPIRACY created something excellent, and the introspective and Gothic ambience of “Mine Forever” (excellent melodies and vocals), the guitar riffs and shreds presented on “How to Find the Light” (but there are clean moments as well), the mix between modern aggressive outfit with ethereal melodies shown on “Seshen” (great orchestrations and rhythmic work), the mix between ethereal touches with Progressive Rock aesthetics of “Split Mind” (the harsh grunts laid on the charming instrumental is amazing) and on “Fragments”, and the blend of extreme Metal with Progressive melodies of “Son of Shame” will attest these words.